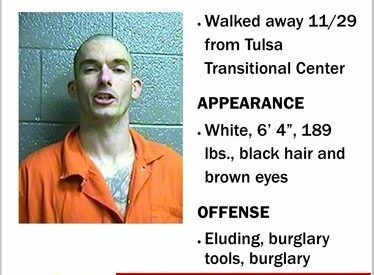 TULSA, Okla. — Stephen Mansell left for work on Nov. 29 and failed to return to the Tulsa Transitional Center halfway house where he was housed. Mansell was serving time for multiple offenses including drug possession, eluding police, second-degree burglarly and having burglary tools. Mansell is described as white, 6-feet 4-inches tall, weighing 189 pounds, with black hair and brown eyes.